This is the classic cookbook, in its entirety—all 524 recipes. “Anyone can cook in the French manner anywhere,” wrote Mesdames Beck, Bertholle, and Child, “with the right instruction.” And here is the book that, for more than forty years, has been teaching Americans how.Mastering the Art of French Cooking is for both seasoned cooks and beginners who love good food and long to reproduce at home the savory delights of the classic cuisine, from the historic Gallic masterpieces to the seemingly artless perfection of a dish of spring-green peas. Since there has never been a book as instructive and as workable as Mastering the Art of French Cooking, the techniques learned here can be applied to recipes in all other French cookbooks, making them infinitely more usable. In compiling the secrets of famous cordons bleus, the authors have produced a magnificent volume that is sure to find the place of honor in every kitchen in America. Bon appétit! 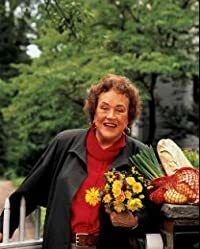 Julia Child was born in Pasadena, California. She was graduated from Smith College and worked for the OSS during World War II in Ceylon and China, where she met Paul Child. After they married they lived in Paris, where she studied at the Cordon Bleu and taught cooking with Simone Beck and Louisette Bertholle, with whom she wrote the first volume of Mastering the Art of French Cooking (1961). In 1963, Boston’s WGBH launched The French Chef television series, which made her a national celebrity, earning her the Peabody Award in 1965 and an Emmy in 1966. Several public television shows and numerous cookbooks followed. She died in 2004. Previous Previous post: Unleash Your Inner Baby! Next Next post: Le réseau de sécurité français en Californie du Sud!